Timing is a common concern for older adults who are planning to move to a 55+ community. Many folks feel uneasy about moving when they haven’t yet sold their home. At the same time, they worry that if they delay signing a lease until their home is sold, space may no longer be available at their chosen community. The Avenues Crofton Park developed its unique Bridge-to-Sell program to give seniors the option to reserve an apartment or cottage without having to pay rent immediately. Our program helps those who have decided to retire at The Avenues Crofton Park, but need some additional time to sell their house or downsize their belongings before moving in. Since The Avenues Crofton Park started offering the Bridge-to-Sell program, we’ve been able to help more people achieve peace of mind while planning their retirement at our community. About one-third of our current residents used the Bridge-to-Sell program to manage their move-in date. One of the program’s early beneficiaries is Marti, who moved in to The Avenues in August 2018 after opting in to the Bridge-to-Sell program in May 2018. When she learned about the option to secure the exact apartment she wanted and choose a flexible move-in date, Marti felt relieved. It can feel overwhelming to sign a lease if you don’t know exactly when your home might sell. Conversely, if you wait until your home is sold to sign a lease, you may feel pressure to act as quickly as possible without adequately weighing your options. 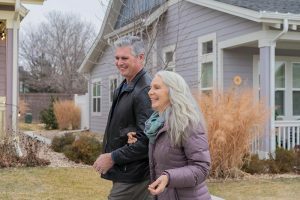 For seniors who have decided to live at The Avenues, the Bridge-to-Sell program helps alleviate some of the planning and stress associated with timing their moves. While it depends on the market, a home typically sells around two months after it’s listed. With our Bridge-to-Sell program, you can pick exactly which apartment or cottage you want to live in and choose your move-in date, even if it’s weeks out. The unit is guaranteed to be there for you when you’re ready. To learn more about our community, our Bridge-to-Sell program, or to schedule a tour, please fill out our online form or contact Corné Lewis at 720-799-0915.